SOLD! 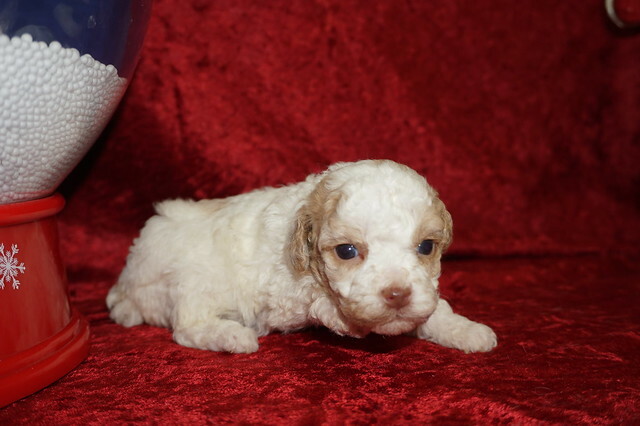 Emma Female CKC Poodle Says Pick Me! Meet sweet little Emma! Her adorable expressions and perky personality are sure to melt your heart. She loves to be cuddled and pampered already; and she gives sweet puppy kisses. She is sure to keep the little people in your life entertained for hours as she does well with children. Emma will come to you with so much love you will wonder how you ever got a long without her. Emma can’t wait to jump into the arms of her fur-ever family so don’t keep her waiting! My new name is Max and my new home Richmond, GA.
Emma is the only female in this litter of two and she is so sweet! Litter Theme is names starting with E’s since mom is Emma. Just look at her gorgeous apricot cream color that is sure to steal your heart. And her adorable docked tail will make you giggle every time she wags it. Her gorgeous curly hair is so soft hair will entice you to run your fingers through it. Mommy Emma is a 7 lb Poodle and daddy Chili Pepper is a 6.8 lb Poodle making her a gorgeous toy poodle. So her estimated adult weight is 6-7 lbs. HAS DEPOSIT! Chili Pepper Male Parti CKC Poodle A Real Looker! Chili Pepper is a happy, outgoing little guy. He loves to spend hIS days snuggled up next to anyone who has a seat on the couch! Chili Pepper is also very active and likes to play with his toys. It is so much fun to watch him play.He would be a wonderful addition to your family and would love you unconditionally.His bags are packed and he is ready to head home to meet you! Waiting on my new name and my new home is Ponte Vedra Beach, FL. Chili Pepper is the only male in this litter of three and he is so sweet! Litter Theme is after Spices. Just look at his gorgeous White cream color with gold because she is a gorgeous parti color, that I truly believe will steal your heart. And his adorable docked tail will make you giggle every time he wags it. His gorgeous curly hair is so soft hair will entice you to run your fingers through it. Mommy Spice is a 7 lb Poodle and daddy Ramzi is a 6.8 lb Poodle making him a gorgeous toy poodle. So his estimated adult weight is 6-7 lbs. HAS DEPOSIT! 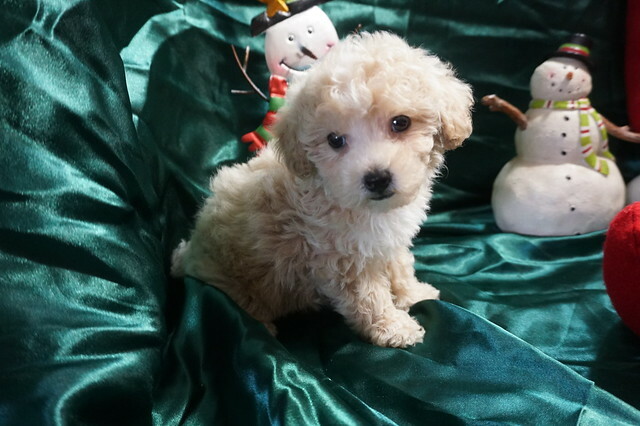 Sugar Gorgeous Female Parti CKC Poodle Such A Sweetheart! This is Sugar! Sugar has a beautiful and unique look; doesn’t she? She also has an amazing personality to match. Sugar loves everyone she meets and loves to shower you with all of her sweet puppy kisses. Sugar will come with plenty of puppy kisses for everyone in her new family. You can’t go wrong with this cutie. Sugar is so anxious to meet her new family. Her bags are packed and ready to go! Sugar is one of two females in this litter of three and she is so sweet! Litter Theme is after Spices. Just look at her gorgeous White cream color with gold because she is a gorgeous parti color, that I truly believe will steal your heart. And her adorable docked tail will make you giggle every time she wags it. Her gorgeous curly hair is so soft hair will entice you to run your fingers through it. Mommy Spice is a 7 lb Poodle and daddy Ramzi is a 6.8 lb Poodle making her a gorgeous toy poodle. So her estimated adult weight is 6-7 lbs. HAS DEPOSIT! 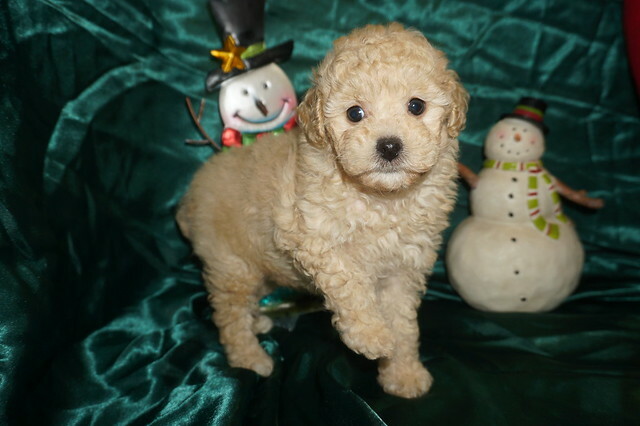 Spice Female CKC Poodle Such A Sweetheart! Spice is one of two females in this litter of three and she is so sweet! Litter Theme is after Spices. Just look at her gorgeous apricot cream color with a small white streak up her face, that I truly believe will steal your heart. And her adorable docked tail will make you giggle every time she wags it. Her gorgeous curly hair is so soft hair will entice you to run your fingers through it. Mommy is a 7 lb Poodle and dad is a 6.8 lb Poodle making her a gorgeous toy poodle. So her estimated adult weight is 6-7 lbs. 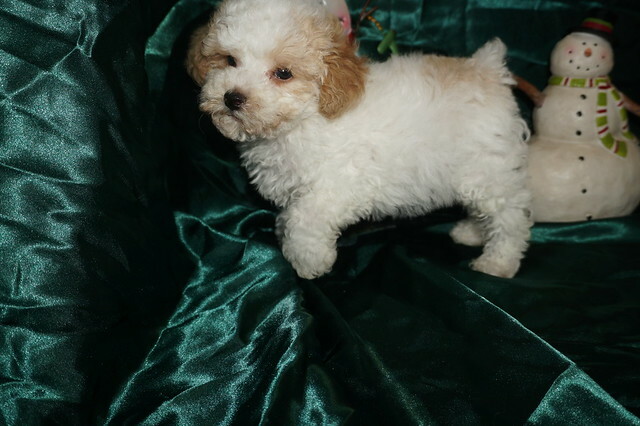 Gorgeous Miniature Poodle Puppies If you see one you love and it says STILL AVAILABLE scroll past past the puppies till you come to their page to learn more about them.